Cats drinking from toilets … matador outfits pieced from M&M packets … exhibits at a museum of oddities? 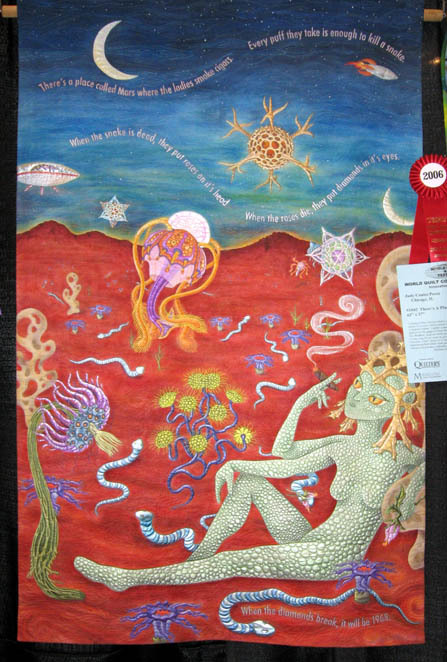 No, these were just a few of the works on display at the 2006 Pacific International Quilt Festival in Santa Clara, California. We were there with a few thousand other people, scooping up the latest and greatest in fiber art materials and admiring the quilts. 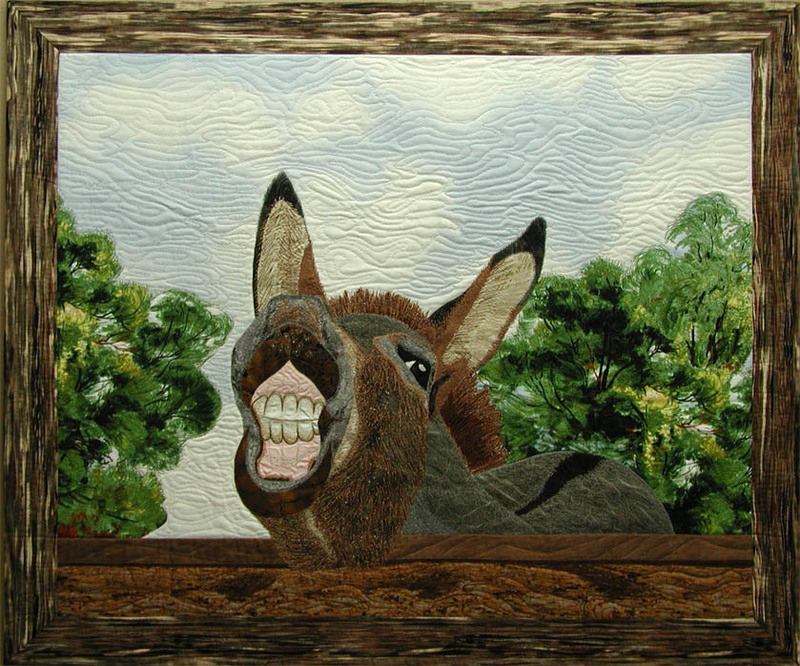 Quilting often has an undeservedly conservative reputation, something we have unfairly poked fun at. 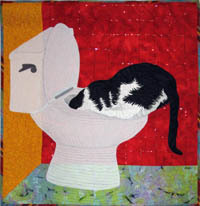 However, although traditional patchwork is still alive and well, by and large shows are populated with innovative art quilts more likely to be seen in a museum than gracing grandma’s four-poster bed. Below we highlight a few of our favorites from the show, pieces that were quirky, offbeat, and simply made us smile. In English “Traje de Luces” translates to “Suit of Lights”, which is the colloquial name for a matador’s costume. Although Ms. Kruk n’ Kempen didn’t literally made her suit of lights, she found a close second in the form of M&M wrappers. 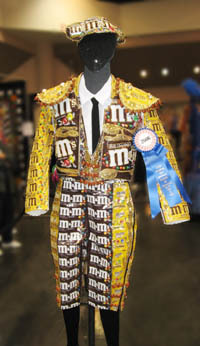 Moreover, the suit has matching shoes with buttons painted to resemble M&Ms. This outfit was the talk of the show, and although the artist’s statement tells us a little about how it was made, it doesn’t tell us why it was made. What drives a person to make a matador’s outfit at all, much devote countless hours to crafting one from myriad M&M wrappers? There’s bound to be a great story behind this, but we may never know what it is. For those who are dying to run out and make their own bullfighting ensembles, the artist used Simplicity 7398 and Butterick 6029 plus a few jillion M&M wrappers. Plan on making it a size or two bigger than you wear now – M&Ms have quite a few calories. This remarkable piece is from the series “A Black and White Tale: Quilts by Ann Fahl”, which can be viewed in its entirety on her website. In addition to depicting the private moments of cats, Ms. Fahl is a big proponent of thread painting and has a great book out on the topic. Here’s a deep link to her site, showing the exquisite detail of the thread painting on this particular quilt. This piece is very large; it isn’t so much a quilt as an experience one is immersed in. Neither the thumbnail at left nor our larger photo do it justice in any fashion. 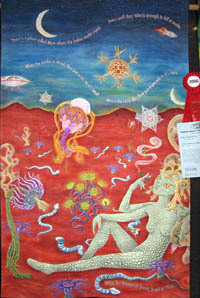 For far better photos and to read about its making, see Ms. Perez’s weblog, “Painted Threads”. Another stunning Judy Coates Perez piece. (Frankly, the woman’s relentless hogging of talent is a bit annoying. Would it kill her to do something mediocre?) 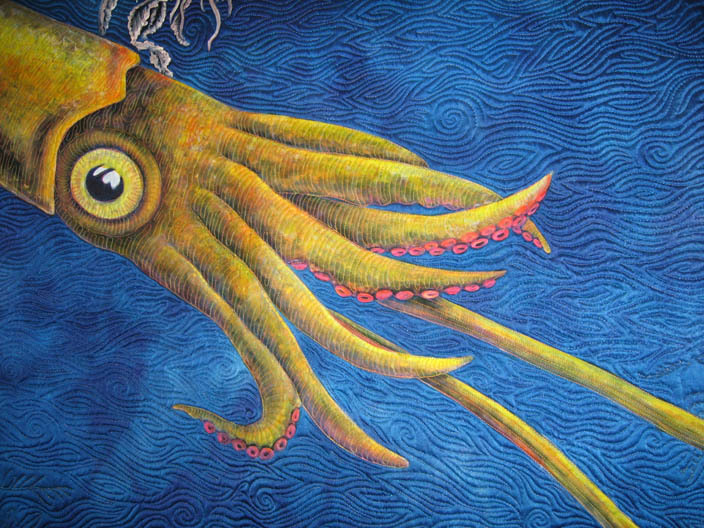 If you can’t have a toilet or a naked Martian lady on your quilt, the next best thing is a giant squid. Like “There’s A Place Called Mars”, this quilt is gigantic in breadth and impact, a bit like being immersed in an ocean teeming with jewel-toned life. It’s worth taking a look at the closeup of the squid to get a better look at the quilting of the water, which is exquisite, and to see how the stitching on the squid enhances its shape. For more photos of this piece and to read about its making, see Ms. Perez’s weblog, “Painted Threads”. This quilt brings back memories! Although fridges like this were undoubtedly quite the thing in their day, in our memory they are inexorably linked with roach-infested apartments. The minuscule, laughable compartment called the freezer was always doomed to be coated with a layer of ice so thick that its door couldn’t be opened. Defrosting sessions were always a dicey business, attempting to pry sections of permafrost off with a sharp knife without piercing coolant lines. Ms. Toy’s fridge has met with a happier fate, however. Instead of being kicked to the curb, it’s been relegated to the garage to chill excess garden produce and a few longnecks. 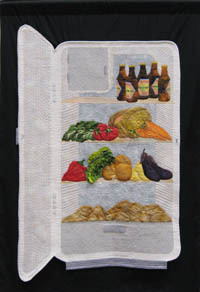 This one is populated by fiber re-creations of garden produce, including wonderful 3D leafy greens. This engaging little burro made friends far and wide, with not a few pausing to bend the rules by patting her back. Had she been real rather than fabric, she undoubtedly would have been rewarded with more than a few carrots. According to Ms. Drennan, in real life Sissy is “a Bureau of Land Management adoptee” who belongs to her neighbor. 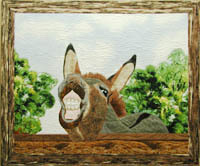 As the title implies, she has a deep, lip puckering fondness for carrots. The thumbnail at left really doesn’t do Sissy justice. 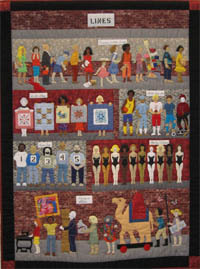 For a better look at the quilt’s thread painting and background stitching, see this larger version. 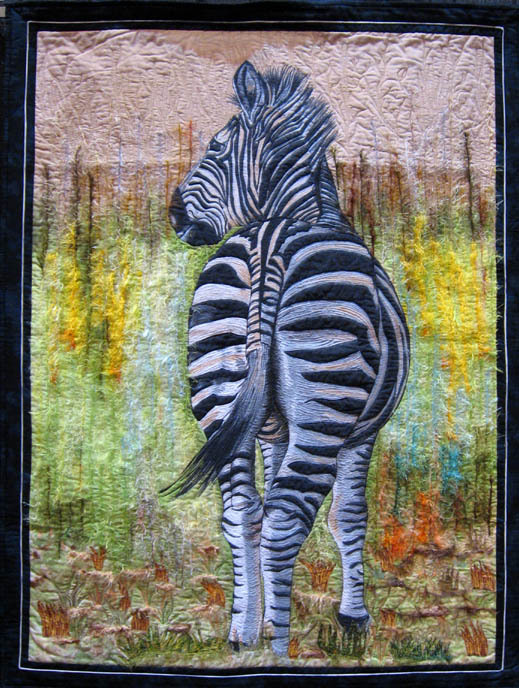 In closeup you can see the considerable effort the artist made quilting the zebra itself, as well as couching on textured yarn for the grasses and other flora. We heard from the artist after posting this story. She told us about a special feature which can’t be seen from the front of the quilt. 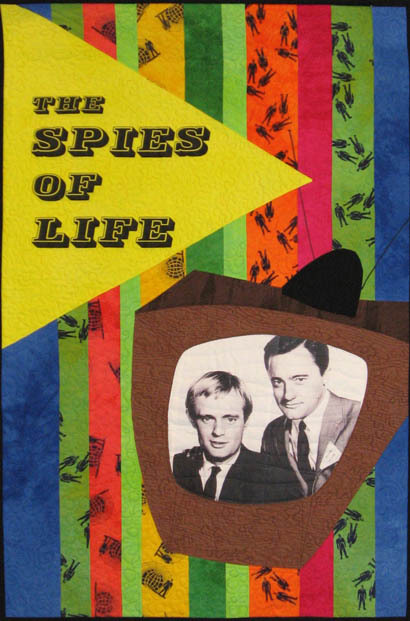 As a child, she and her friends played “spies” using a tiny communicator radio cleverly made from a pink pearl eraser, a ballpoint pen, and a corsage pen antenna. A photo of a replica of this radio can be seen on the back of the quilt, a cheerful reminder of the past. 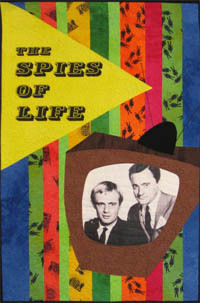 The back also includes a photo of Don Adams’ (of Get Smart fame) shoe phone. It’s fun. It’s hip. We like it. “Lines – we all stand in them – one way or another”, the artist tells us matter-of-factly in her artist’s statement, then stands out of the way and lets her quilt speak for itself. Ms. Piatt’s bits of cloth and thread create a droll world. Upon close inspection we see lady emoting over a broken ketchup bottle and that stock character of “5 Items or Less” lines, the oblivious lady with fully-loaded cart. And where on earth did that man at the bottom of the quilt find a camel on wheels? 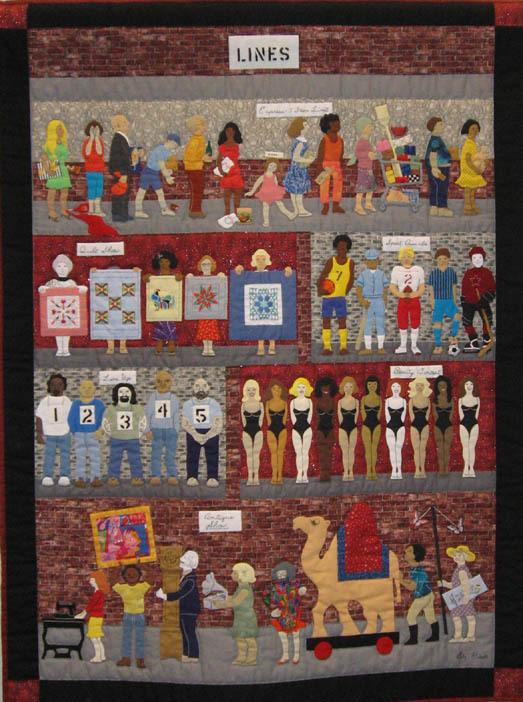 Juxtapositions of characters also lend humor to the quilt, with somewhat grim-looking men in a police lineup sandwiched between beauty pageant contestants and prim quilt-bearing women at a quilt show. Our very own Kitsch Kwilt was at the show as well. More details about it are available elsewhere on this site.